All figures are available onscreen. The printed FAA Computer Testing Supplement is sold separate. Pros: Updates give you the latest charts, tables, graphs, and questions. Review: Very useful prep tool. The charts, graphs, and tables are OK. The U.I. sometimes will cause you to answer the wrong question unintentionally but overall this is very necessary if you want to have a chance of doing well as opposed to JUST good enough. Pros: Ok for individual questions. Review: Many old graphics. Not up to date despite the 2016 title. Review: There have been a couple of questions that I've been getting wrong. Then reading the explanations, it is obvious that the figures they based their answer on is not the figure that you are given in the question. Review: ASA INTRUMENT RATING SOFTWEAR IS CURRENT AND THOROUGHLY EXPLAINS ALL ANSWERS. STUDENTS SHOULD HAVE NO PROBLEMS USING THIS PREPWARE. Pros: Short but sufficient explanations to the questions with links to further reading when in a study session. Review: This software based learning aid is what I expected. It has all of the questions and answers broken down by subject mater with chapters so one can study a particular topic before moving on. I would buy it again. Review: I would consider this a requirement. I could not have passed without it. If you put in the time studying you will pass. Review: The test prep software is the best and fastest way to prepare for a written exam if the student is motivated enough to challenge himself repeatedly by taking exam after exam until (s)he can score 100% routinely. Those who wish to have someone else direct them will do better in a formal classroom, but for me that takes longer, costs more, is more difficult to schedule, is more boring and doesn't get as good results. As an instructor I insist that a student show me that he can pass three practice exams in a row with score of at least 80% before I will endorse them for the written exam. Cons: Format is difficult to use, unable to zoom in to read around clutter on Low enroute charts. Q: Does the Instrument Prepware have the option to email test scores to an ASA certified flight instructor to obtain an endorsement to take the FAA exam? A: You can choose to print results, or e-mail them to your ground or flight instructor to obtain endorsement to take the FAA test. Or, you can get the instructor endorsement (sign-off) directly from ASA for no additional cost upon completion of the course. Q: how many computers can I load the test prep on? A: This product only includes the software. 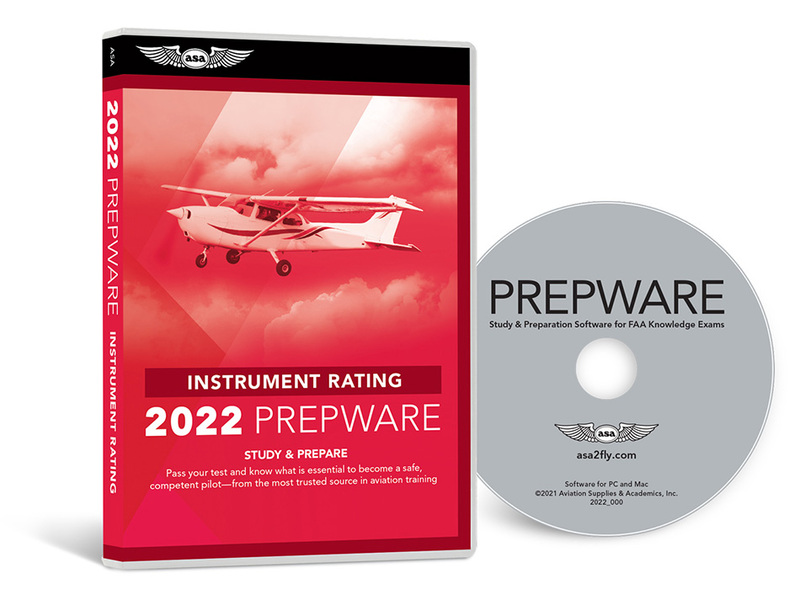 If you would like the book and the software you would want the ASA Instrument Rating Test Prep Book / Prepware Software Bundle. Includes Instrument, Instrument Ground Instructor, CFII, and Foreign Pilot tests. Includes book and software for Instrument, Instrument Ground Instructor, CFII, and Foreign Pilot tests.